Week eight of Baseline Shift’s Wednesday morning sessions marks a very exciting occasion. 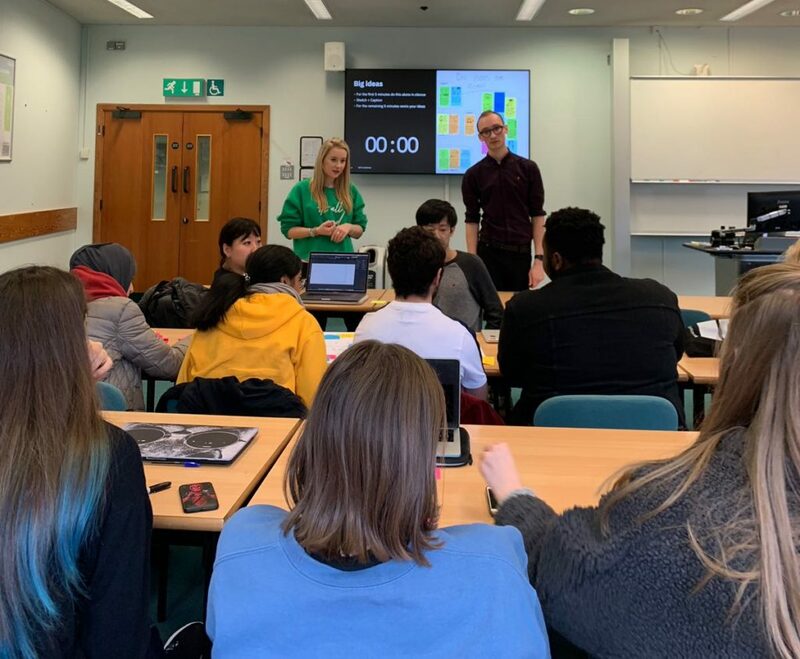 A visit from Milly Longbottom and Will Trickey, alumni of our department who graduated from Graphic Communication and Typography in 2016 and who now work at IBM. Originally associated with being instrumental in inventing the computer, IBM is no longer focussed on physical product design. Instead, they take on service-based, user-friendly products for blue chip clients across the world. IBM designers like Milly and Will therefore produce and work on a lot of digital projects. IBM iX is IBM’s client-facing design agency, working to produce products sold or used under the name of the client. Members work directly with their clients to follow a very user-centric design approach. Many of their clients are very large: well known companies including IKEA, Selfridges, Ford, the National Grid and Nationwide. Milly and Will went straight into the company after graduating, starting off by undertaking a three week course in basic client-interaction skills. This was completed at an IBM office in Winchester and involved learning about business, design thinking and technology. They then worked together on a huge project conducted for BP, illustrating the true extent of the big-names they are involved with. It’s a sign of how big company’s, with the right recruitment and training in place, can let new starters loose on important projects at a surprisingly early stage in their careers. The design carried out by IBM iX is very people-centric. The client and the user’s needs are considered at every step of the creative journey to ensure that the end product result is suitable and usable. Milly and Will also explained the ‘design loop’ strategy that they use, based on the double diamond diagram common in many design thinking implementations. 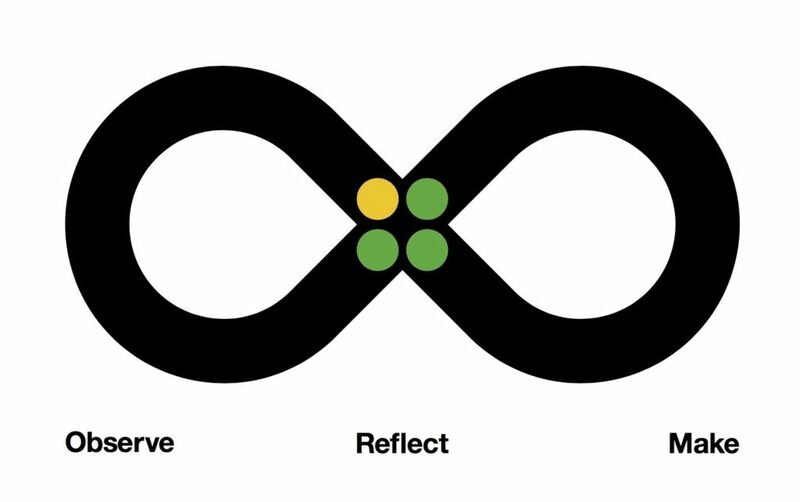 This involves an infinity loop with different points representing each stage in the continuous design process. These stages are exploring and observing users, reflecting in order to bring ideas together and finally making something that solves the problem in hand. As well as informing students about their design process and life at IBM, Milly and Will also advertised the unique design opportunities available in the company. These include summer internships, year placements and graduate design consultant schemes (the path in which Will and Milly both entered the company on). Having placed a huge emphasis on the social aspect and the friendliness of everybody on the design team, these opportunities seem very attractive to students on the Typography and Graphic Communication course, which Milly and Will believe provides a brilliant foundation for a route into IBM. A project at IBM usually begins with a one to two day long workshop session with the client. Milly and Will took us through a condensed version of their journey, giving us an insight into how a highly successful agency functions, in the space of an hour. This workshop emphasised the importance of what is known as ‘design thinking’ in producing a product which is functional and successful for the intended user. This involves ensuring that the user is at the heart of every product that is designed. Milly and Will emphasised the importance of this as being the designer, you are not the intended user of the product being designed. It is therefore essential to gain as much information as possible from the perspective of the user, who knows the problem and has specific needs which must be met. 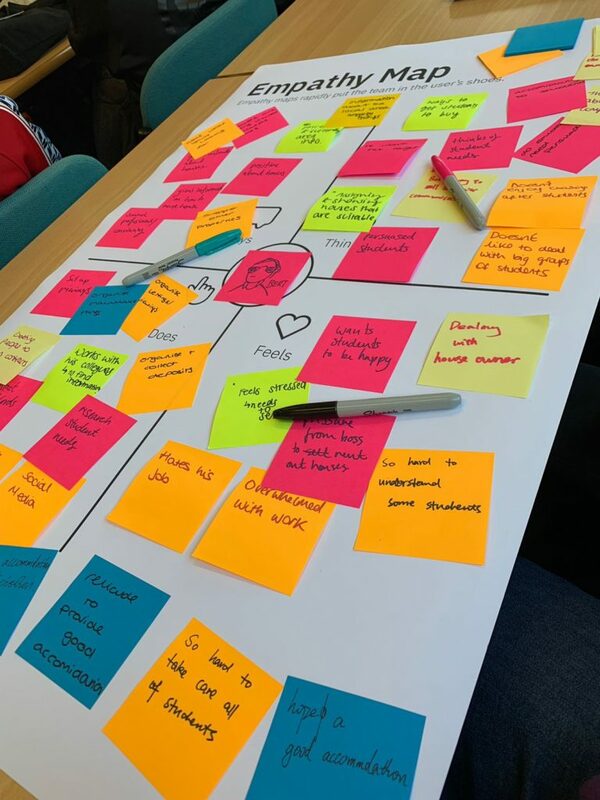 Students were proposed the problem of trying to find accommodation to rent at university and used what is called an ‘Empathy Map’ to think the personality and situational traits of different types of people who could potentially be posed with this problem. 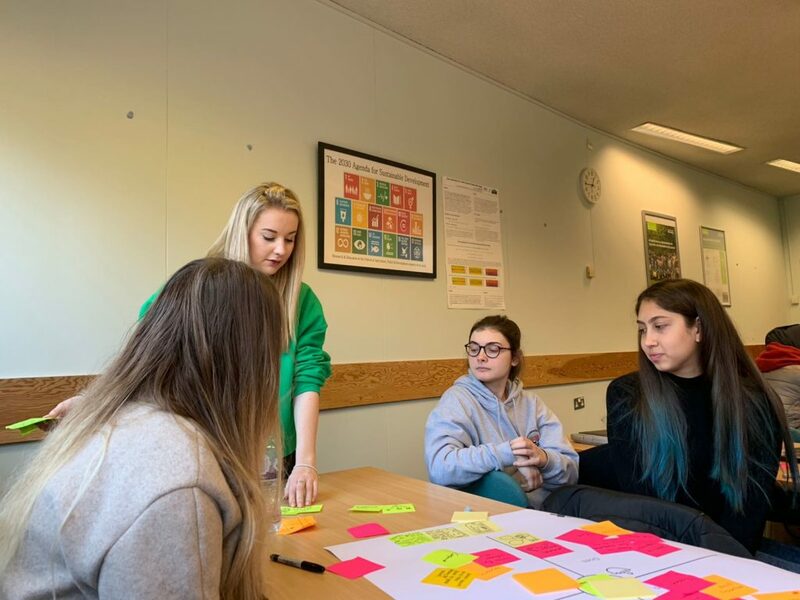 This ‘user’ or ‘persona’ was placed in the middle of the empathy map and students were tasked with recording what the user might be thinking, saying, doing and feeling in relation to their situation or problem. 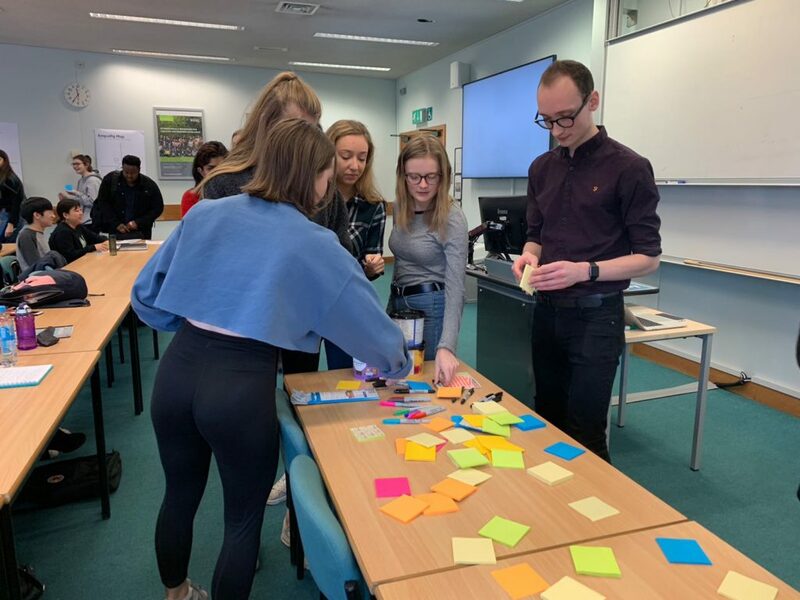 These factors including actions, quotes, expectations, reactions and values of the user were presented on post it notes and placed in the correct section in order to create a massive ‘mind map’ of ideas and thoughts related to the problem and user. After this, post it notes were grouped together into themes and can be rearranged into a user journey. Stickers were used in a ‘dot voting’ process to arrive at a key user-centred plan for a problem solving strategy. 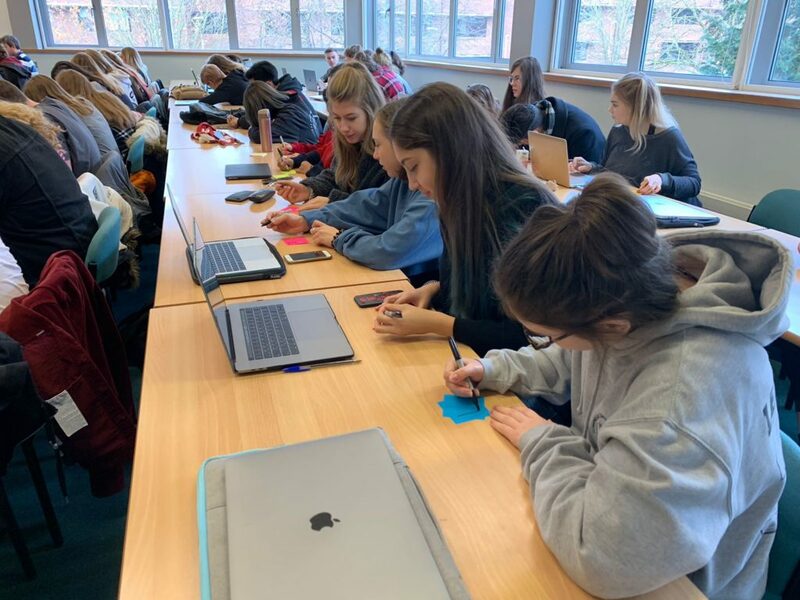 A few keen students were given the opportunity to show their portfolios to Will and Milly in order to receive feedback from a designer in the industry. One of the strengths of the course at Reading is the quantity and quality of professional people we get exposed to, whether it’s printers, designers or creatives in other fields. For Milly and Will to give up their time to share their knowledge and time with us felt amazing. It’s also really positive to see how Reading graduates are valued by their employers, and can forge successful careers so soon after graduation.